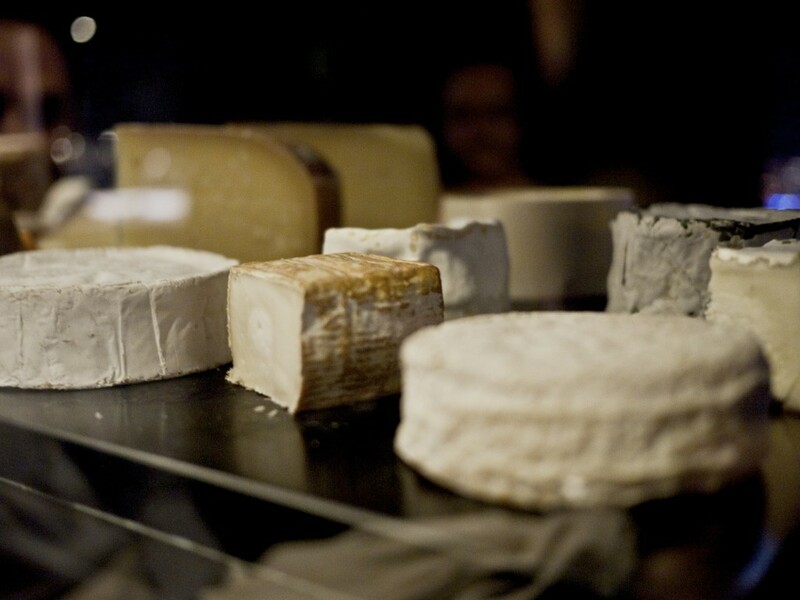 I’ve always regarded Vue de Monde very highly ever since my first visit back in 2010. Of the handful of restaurants I visited with my wife during that trip, Shannon Bennett was the only one who managed to excite my palate with his food following the disappointing meals at Cutler & Co and the highly acclaimed Quay. 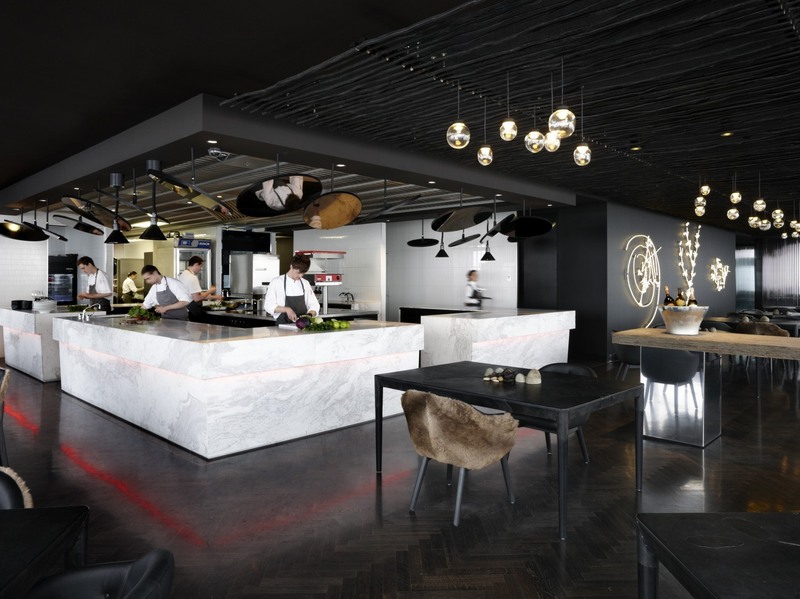 How Vue de Monde has not dominated the Gourmet Traveller list is still beyond me. I guess it’s one of those unexplainable mysteries in life, just like how Iggy’s in Singapore made the San Pellegrino’s 50 Best Restaurants list when I wouldn’t even consider them in my top 200. 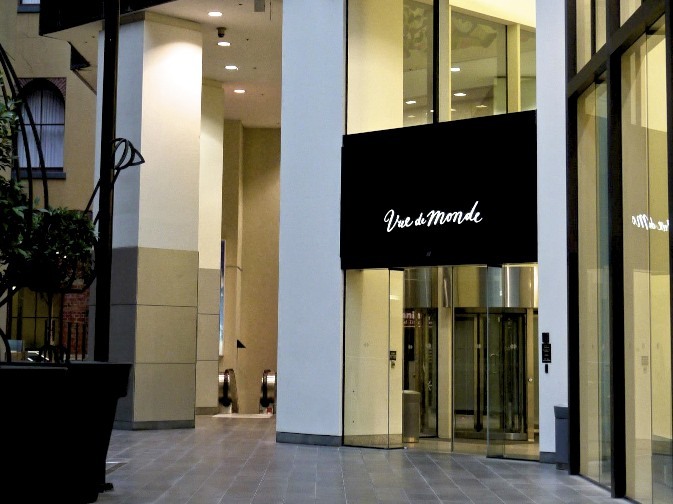 Since my last visit I had heard via my wife (who took a sneaky meal there with my father in law in my absence) that Vue de Monde had gone up in the world. Literally! Since my last visit, Vue de Monde had moved from their humble digs on Little Collins Street to the 55th floor of the Rialto, previously the observation deck. According to my wife, Vue de Monde was now complete. Not only did it have the best food and service in Australia, it also had a spectacular view and aesthetic of a modern fine dining restaurant. One that was on par with many great names in the world. Obviously I was keen to return. 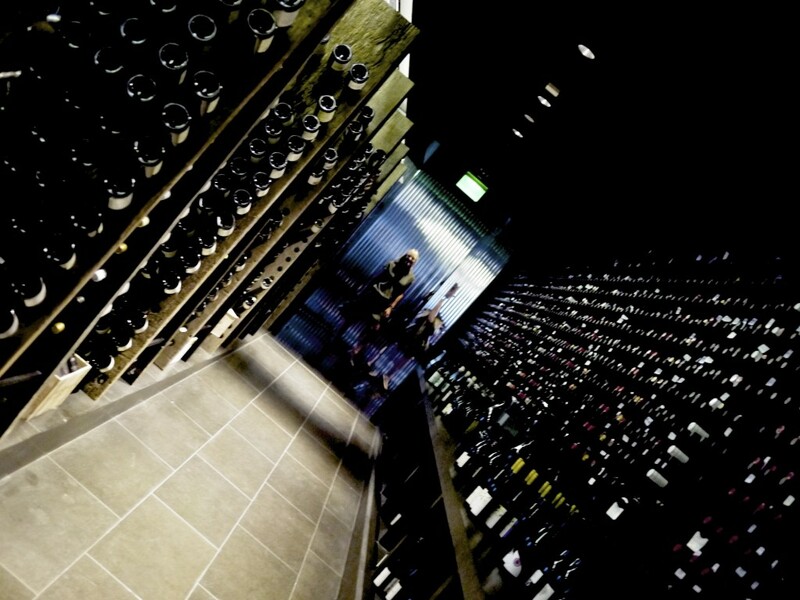 Sadly it was a couple of years later that we finally had the opportunity to return in style by hiring their private Dom Pérignon room for our wedding guests as a number of them had flown all the way from the many corners of the world. Some of my guests had also visited Quay and the Royal Mail Hotel a few days before so I was very keen to hear their opinion as it had been a couple of years since my wife and I had been to either. 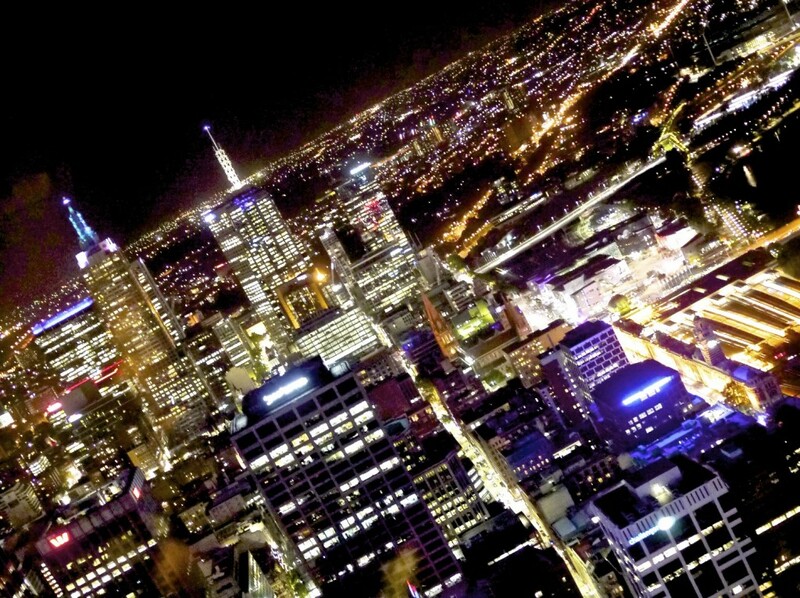 Suffice to say, our guests were blown away immediately at the start of our meal by the stunning view of Melbourne by night as a backdrop. I was very fond of their Paul Smith designed chairs when they were at Little Collin Street (which consequently were flogged off and my wife refused to let me bid) but I liked their futuristic aesthetical transformation. At first glance the room looked slightly cold and modern but at closer inspection you began to comprehend there was much more to it. The thought and attention gone into Ross Didier’s sophisticated furnitures embodied and captured the spirit and soul of Australia. This was Australiana without being kitch and I loved it. The armchairs had been upholstered in kangaroo leather and skin, making it extremely comfortable for the six hour tasting menu we were about to embark on. The conventional table linens had been replaced by a stitched dark and textured kangaroo hide which covered the entire table, perfect to lean on with your elbows. 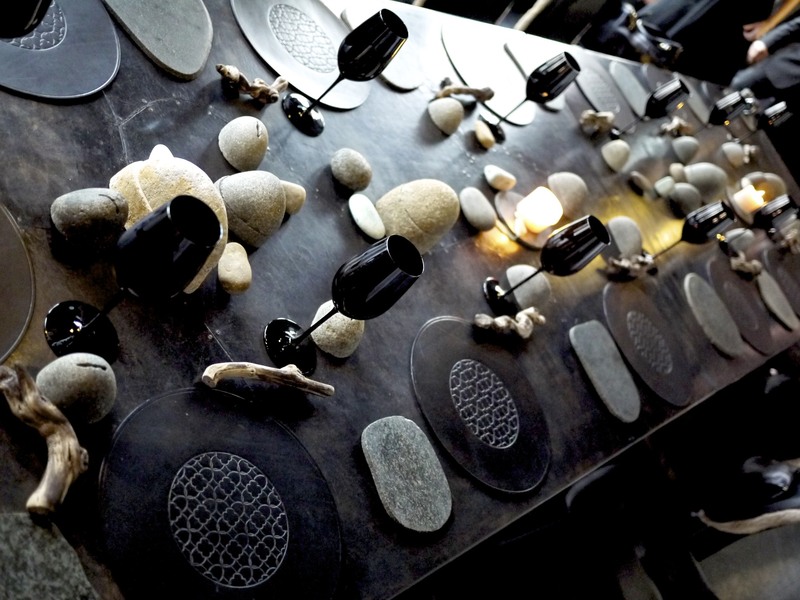 Even the pebbles scattered across the table turned out to be more than decoration and played an integral part of the meal as the night progressed and the menu unfolded. A glass of NV Larmandier Bernier ‘Cuvée Vue de monde’ Vertus Champagne AOC, France was poured out for everyone to start the evening with some hand-cut parsnip chips and a macadamia and apple dip. 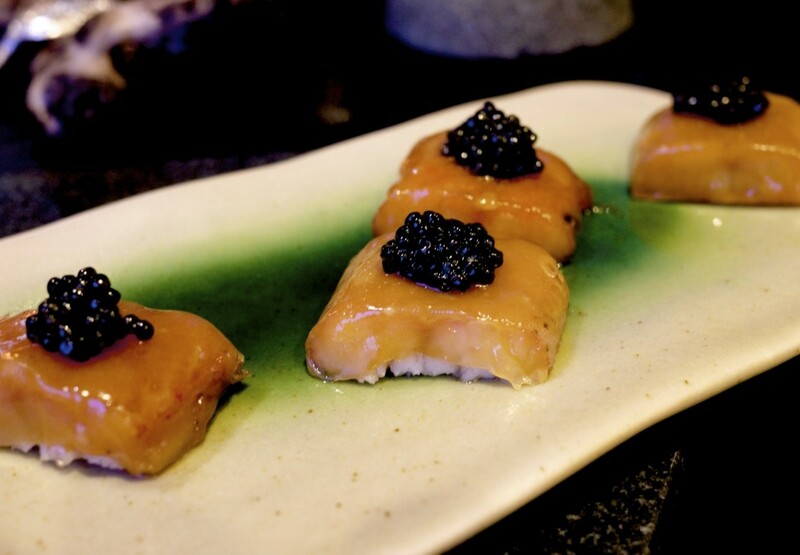 The meal then kicked off with an array of amuse bouches starting with Smoked eel, white chocolate and caviar. This had a good textural contrast of the brittle caramelised coating and soft eel inside, although for me there wasn’t enough seasoning coming from the caviar. 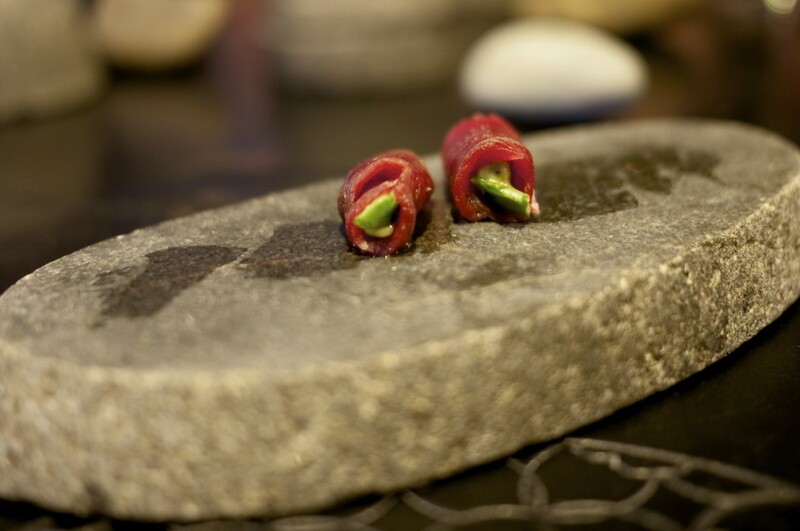 This was followed by Salt cured Wallaby and wasabi. The dried meat reminded me of a very high quality bresaola. I thought the wasabi was a very clever addition as it cut nicely into the meat. 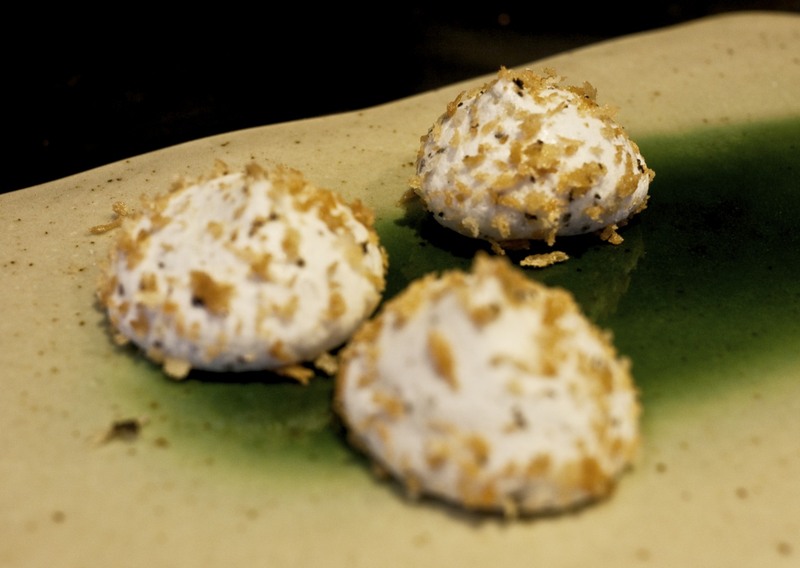 The Truffle marshmellow had a nice crunch from the bread crumbs although the truffle was a bit lost for me. 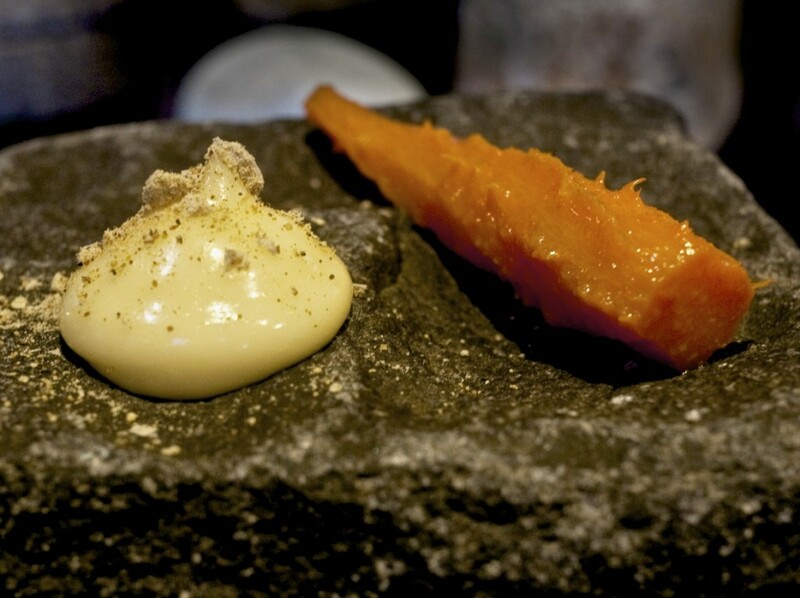 Lastly we were served a Carrot with egg and brown butter emulsion and oyster. It had a good level of sweetness. This was an interesting dish and the flavours reminded me a lot of the langoustine from Noma (of course with at least one major difference!). There were a few options available from the menu but we all opted for the most comprehensive package of the 10-course degustation menu ($250) with matching wine ($150). A couple of my guests matched their meal with teas, something up and coming in Australia which appeared to work really well. 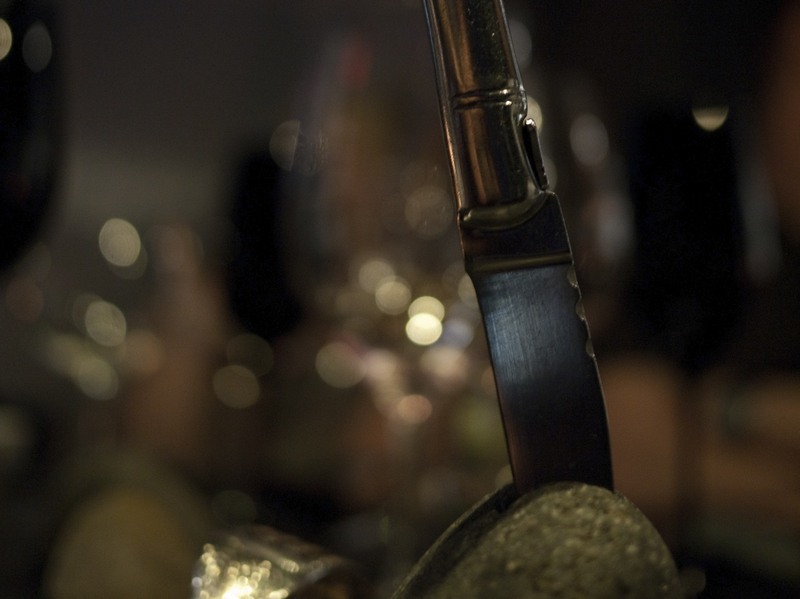 To match our first course of Roasted marron with tarragon butter, we were poured a glass of what I call butter on a stick, 2010 Domaine Bachelet-Monnot, Puligny-Montrachet, Cote de Beaune, Burgundy, France. The tea sommelier on the other hand served a pot of Tie Guan Yin, Oolong, China. The plump freshwater marron tail sourced from Western Australia was handled with the utmost respect, and it was lightly roasted to keep it moist and juicy. We were advised to pick up the marron tail with our fingers and dip it into the rich toffee-like tarragon brown butter and the intense marron salt. 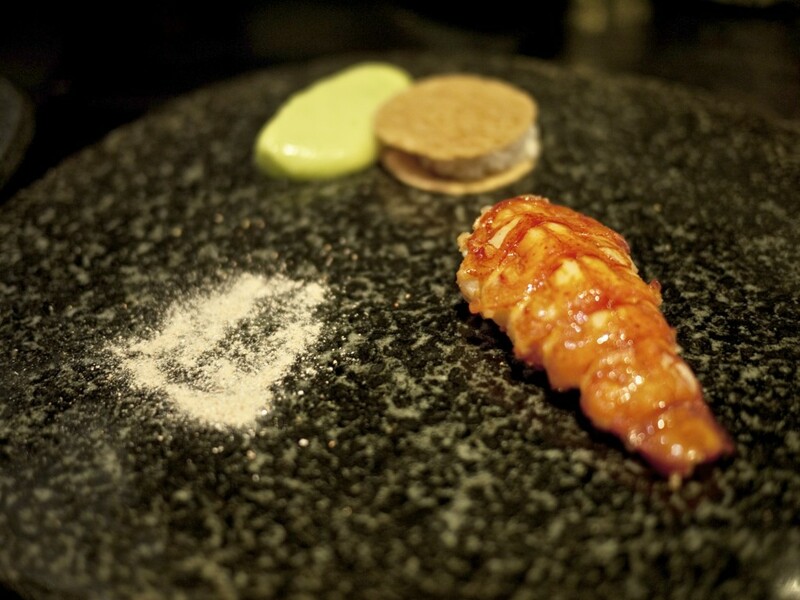 On the side was a sandwich of crispy kohlrabi with a creamy marron filling. It was a very good dish. Shame they didn’t have two tails! Next up was the Duck yolk, pork, green beans and mint matched with a generous glass of 2003 Dom Pérignon, Épernay, Champagne AOC, France and for the tea lovers a Yunnan White, White Tea, China. The fresh mint cut through the creamy yolk. 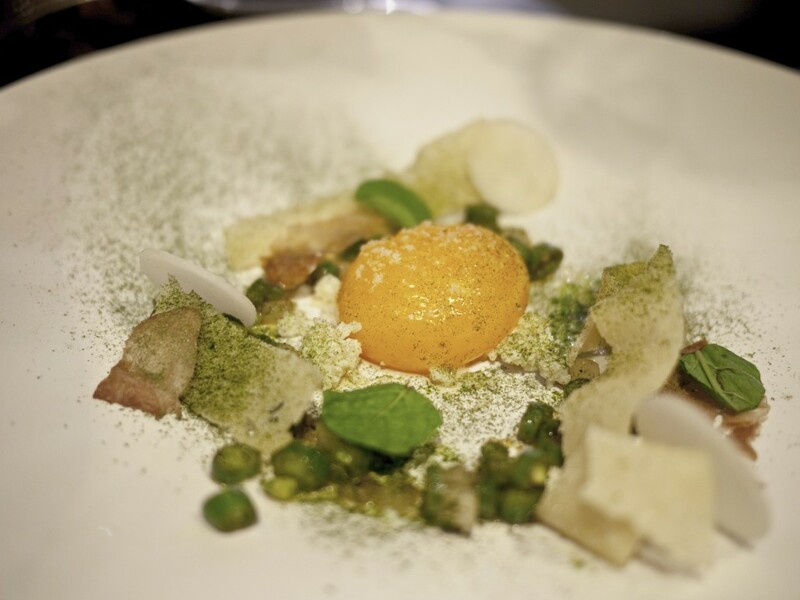 The yolk had been poached at 58 degrees celsius so that it oozed beautifully over the crispy pork and green beans. The only thing I felt was missing to this delicate dish was a bit more seasoning. Overall I didn’t feel there was enough pork for that seasoning element. So close to a perfect dish. What a shame! I was very surprised with the next installment. Whilst strictly not a dish, I feel it deserves a special mention. 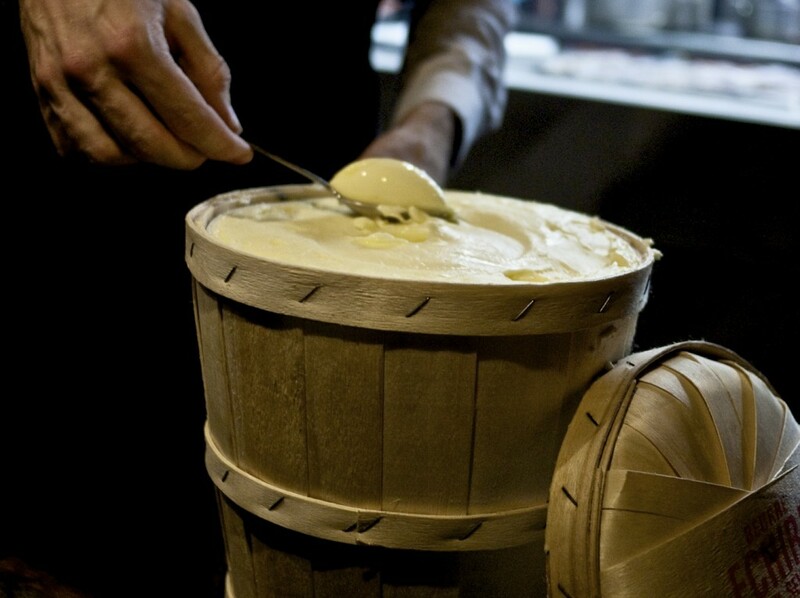 Head Chef Cory Campbell came in with a wooden bucket on a trolley. 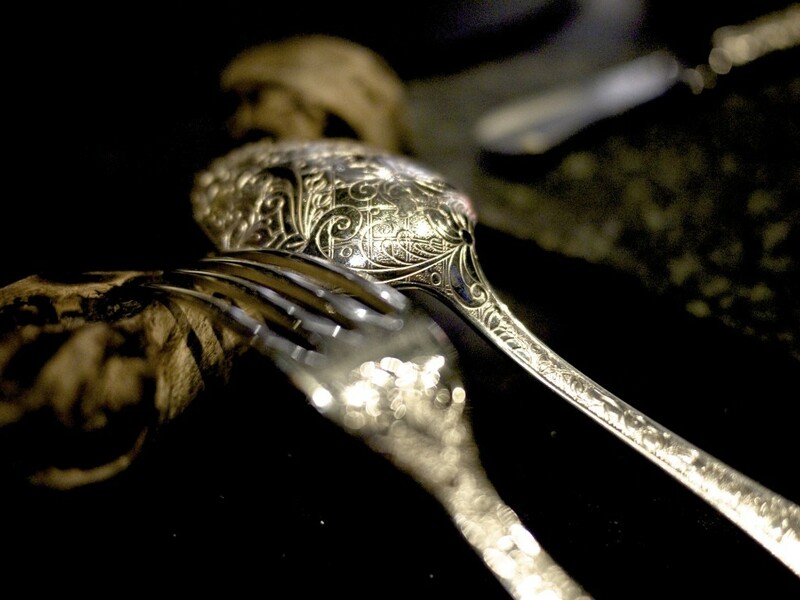 It contained the luxurious Échiré butter, typically served in three star establishments in France and a long standing favourite amongst the European royalties. 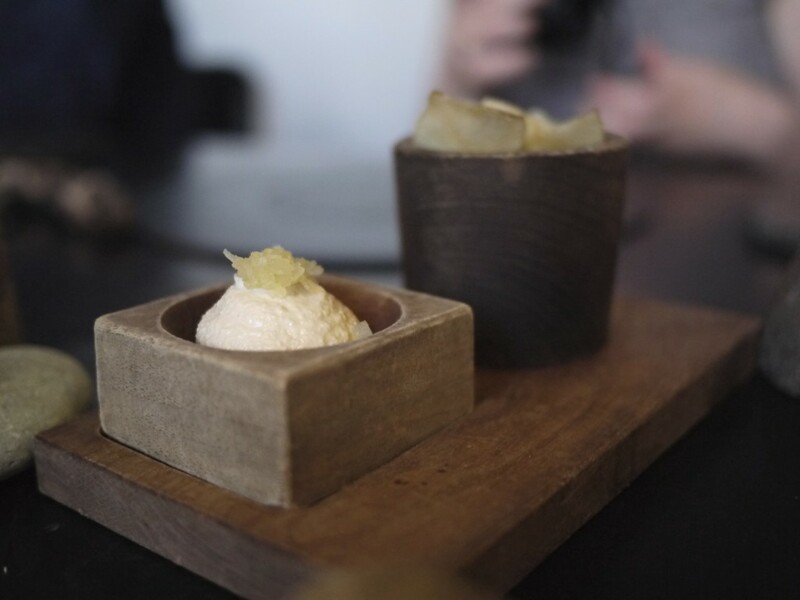 He scooped out a few quenelle and served it with a beer and fennel sourdough. As mentioned countless times, I’m partial to good butter and bread, and this was delicious. I almost forgot the mother tongue of Vue de Monde was French, despite the evident Australian twang. The next dish of Melbourne onion soup illustrated this juxtaposition. 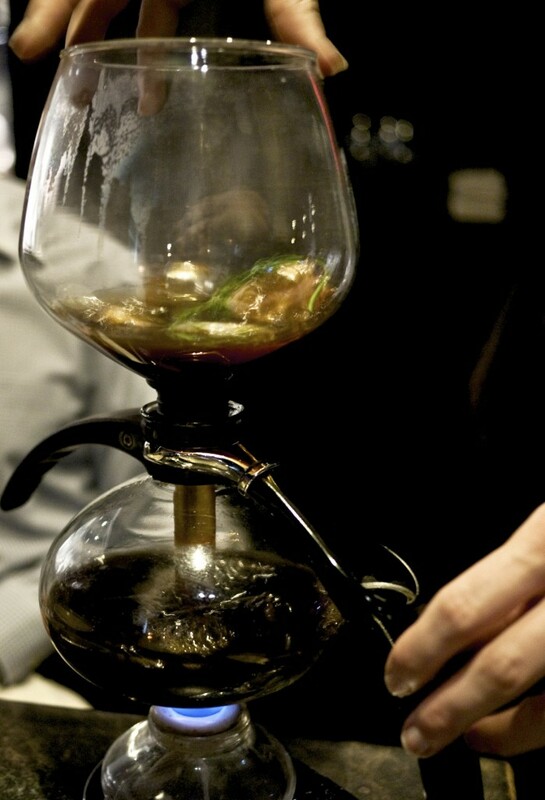 Charactertistic of Bennett, he displayed his interpretation on classic French cuisine by adding a local twist, using an instrument that would normally make the Melbournian’s favourite beverage: a coffee siphon. 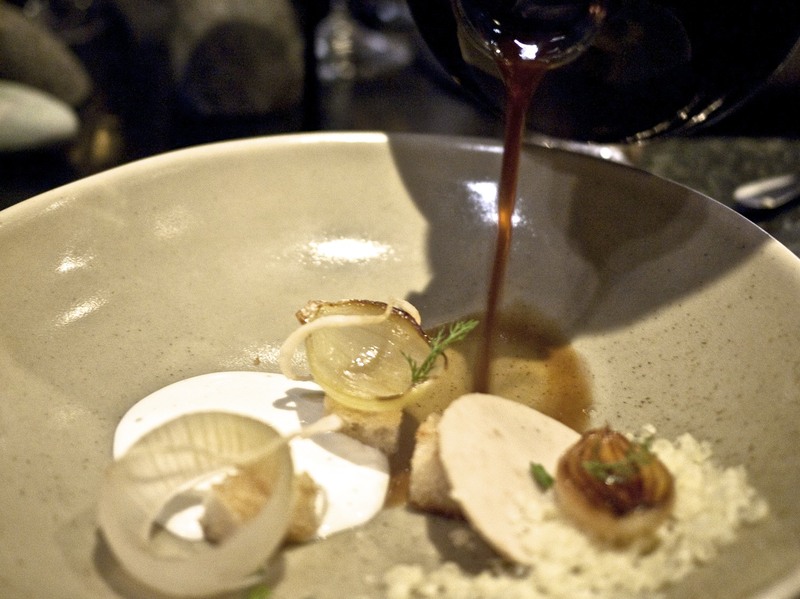 The onion consommé which had been brewed in advance for 48 hours at 96 degrees celsius was heated up using a blowtorch, forcing the liquid to slowly cascade to the top where it was infused with fennel herb and caramlised onion. The mixture was then poured into each individual’s bowl over an onion prepared in multiple ways – charred, pickled, crisped and poached. The finishing touches included shavings of comté cheese, crispy croutons and macadamian gel set in agar. The result was a remarkably sweet and intense onion soup which had the right balance of cheese and variety of textures. I always find it quite risky to serve soup at a fine dining restaurant but this dish was outstanding and inspired. It was remarkable. Next up was Sweet baby corn, brown butter and black truffle, served with a glass of the locally famous 2000 Yarra Yering ‘Dry White Wine No.1’, Yarra Valley, Victoriaor a rather surprising Zealong, Oolong Tea, New Zealand. I had no clue New Zealand produced oolong tea but even more astonishing was that the black truffles sourced from Western Australia were from the same specie as the highly prized Perigord truffles (tuber melanosporum). 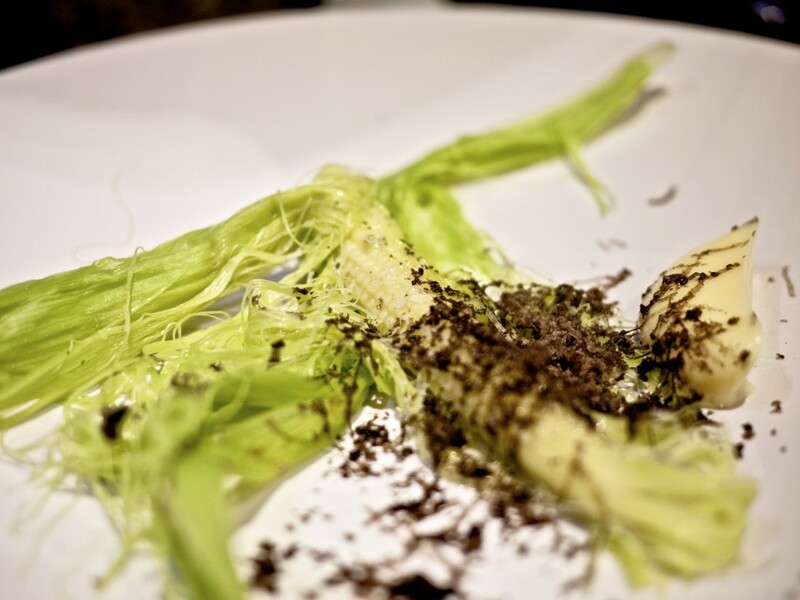 The baby corn cob cooked and presented in its husk with the brown butter emulsion had bursts of flavours; so much so that I ate the husk as well! The black truffle shavings added an earthy element to this simple yet delicious dish. It’s not uncommon to have a second palate cleanser between segments of the meal although Vue de Monde is the only place I know that does this in Australia. A bowl containing a beautiful herb and flower salad was presented. Liquid nitrogen was then poured over the top, and the instantly frozen salad subsequently shattered using a wood pestle. 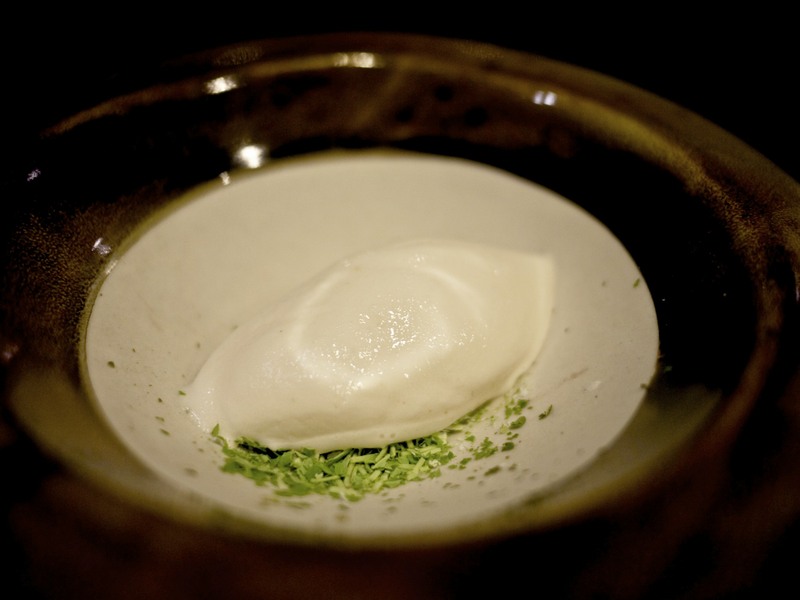 Once settled, a quenelle of Grapefruit and lime sorbet was placed on top to produce a very refreshing palate cleanser. Following such a invigorating palate cleanser, the first of the three main dishes was Prawn, nettle, young garlic, smoked barramundi, lettuce, served with one my favourite local wine of 2010 Kooyong Estate, Pinot Noir, Mornington Peninsula, Victoria or Woojeong, Green Tea, South Korea. This was another classic Australian dish where the prawn, sourced from Mackay, was prepared “on the barbie” to give a smokey taste and smell. 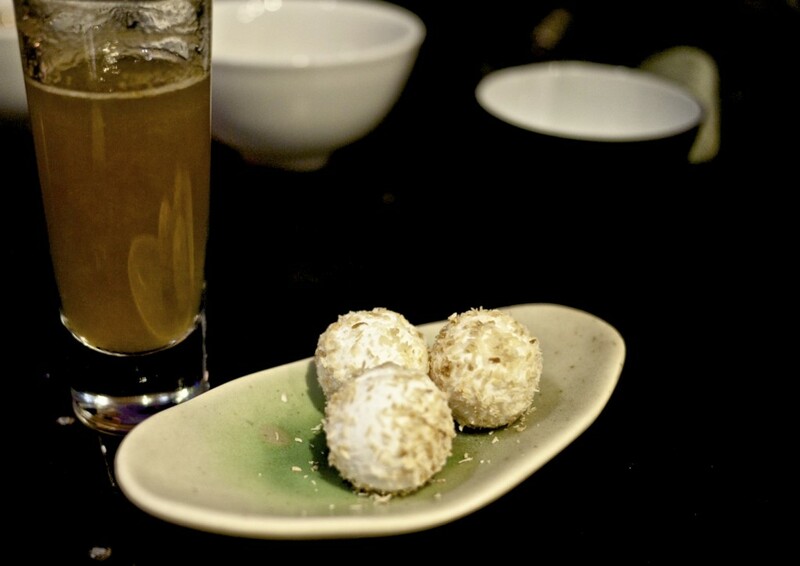 It was accompanied by a clean and flavoursome Barramundi which had been preserved using the Japanese method of “iki jime” (spike to the brain) in order to retain freshness, flavour and most importantly kill the fish in the most humanely possible way. 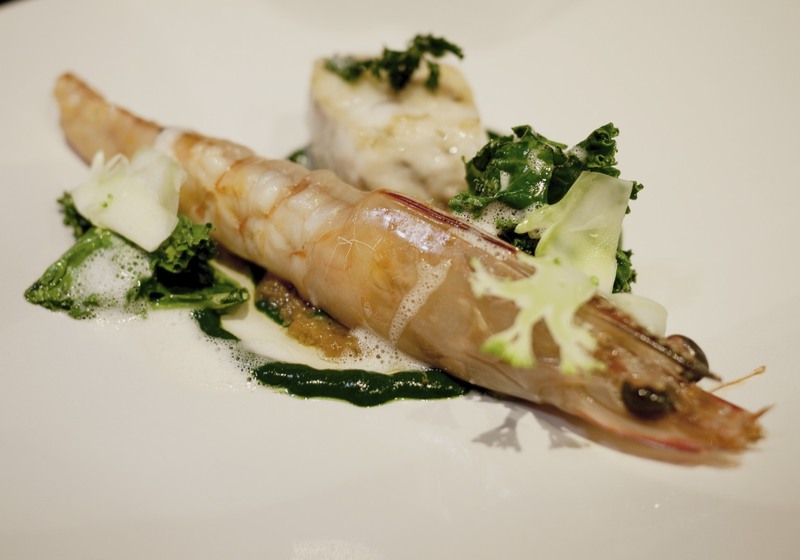 The prawn and fish were served on a bed of garlic purée, with garnishes of nettle, young garlic, kale, lettuce and broccoli that provided some textural contrast and sharpness to the dish. Possibly the best barramundi I’ve tasted to date. 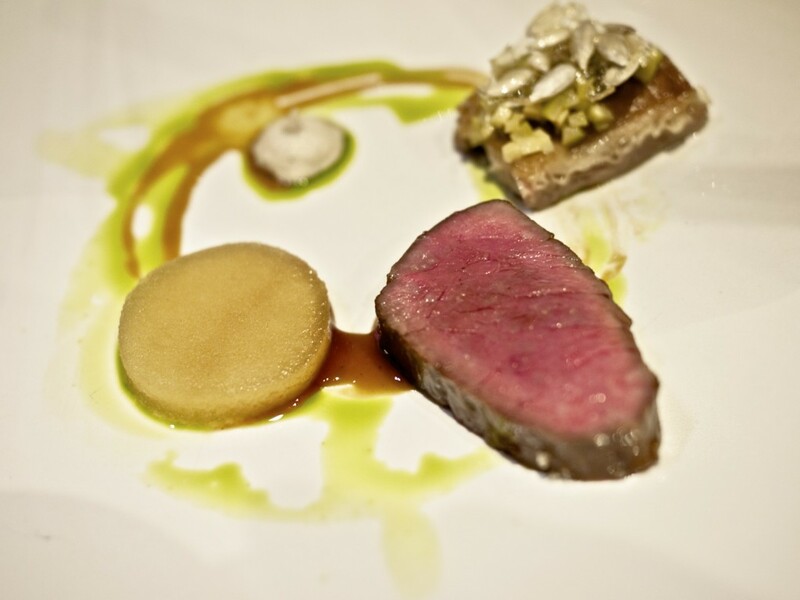 Finally on to some red meat with the Flinders Island Lamb, olive, Australian anchovies, mustard. The lamb was served two ways – a roasted loin and a crispy belly – and certainly melted in your mouth. 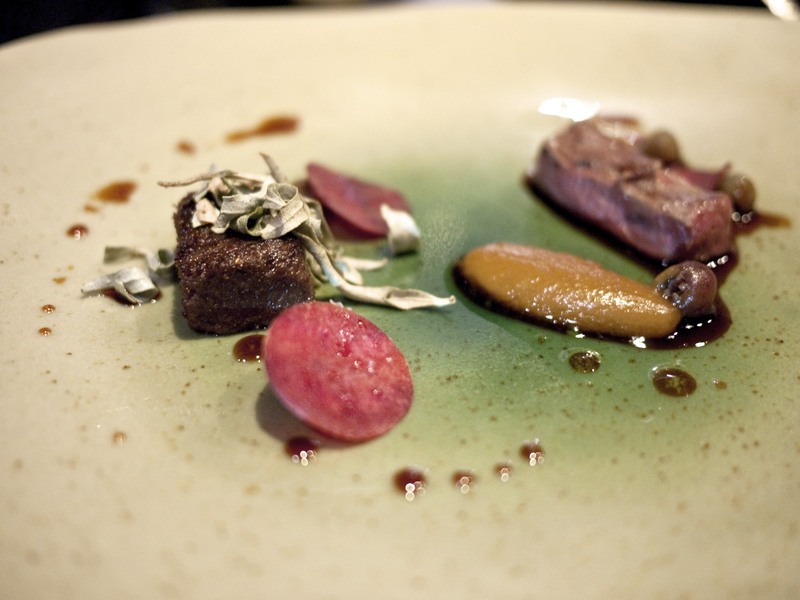 Just like the wallaby I had tried at Attica from Flinders Island, it was of superb quality. I was not very fond of the crust of seeds around the belly however and would have preferred a naturally crispier skin. Whilst the lamb was superb in quality, I thought the overall flavour was quite average. The matching wine was 2011 Thousand Candles, Shiraz Pinot Noir Sauvignon Blanc, Yarra Valley, Victoria and Kaga Bocha Hojicha, Roasted Green tea, Japan. I had some great memories from the wagyu course I had here last time and was hoping to see it appear in the menu again. I was in luck, or so I thought with the Blackmore Wagyu, beetroot, saltbush, BBQ sauce, truffle.The cheek and tenderloin of the locally reared beef was riddled in marble and melted in your mouth. The sweet home made BBQ sauce was lovely on its own but I felt it completely dominated everything else on the dish from the saltbush and beetroot purée to the black truffle shavings. What’s more, I felt there was not enough seasoning on the dish. The glass of 2008 Querciabella ‘Camartina’, Maremma Toscana IGT, Tuscany, Italywas a consolation and a rather smokey Lapsang Suchong, Black tea, China was matched for the tea drinkers. Some cheese and a glass of 1988 Fonseca Guimaraens Vintage Port, Douro, Portugal to cheer me up from the lacklustered two courses. The cheese was decent and I was very impressed that they actually had a tea to match the cheese course with the Hong Shui, Oolong tea, Taiwan. The third and last palate cleanser of Passionfruit, liquorice and coconut “beer”. I don’t particularly like liquorice but thought it worked really well as an aftertaste with the passionfruit and coconut sorbet. My favourite course of the evening was the first dessert course of Strawberries and cream served with a rather delicious 2006 Dr Loosen, Riesling Beerenauslese, Mosel Saar Ruwer Qmp, Germany. It had nailed all the elements from the creamy ice cream, crunchy and chewy meringue to the fragrance emanating from the cold shavings of frozen strawberries. The icing on the cake was the natural sweetness coming from the strawberries which was divine. I was impressed at how such a simple dish could be so delicious. It was a shame that a few of my guests had to rush home before having the last dessert as they needed to relieve their babysitters from their kids. Well… It was 1.30am after all (we started the evening at 6pm). The Chocolate soufflé chocolate mousse, crème anglaise was rather decadent and luxurious, and a not so subtle reminder of the French influence in Bennett’s cuisine. It was definitely in the best five soufflé I’ve had. 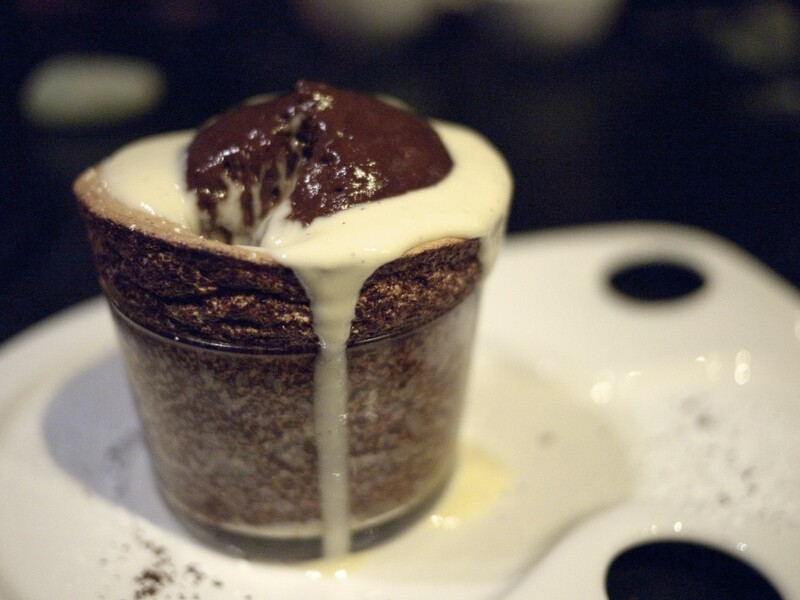 The crème anglaise was much needed to balance against this imposing tower of chocolate sweetness. I would however say that the combination of this and the 2009 Domain Madeloc, Banyuls Cirera, Languedoc-Roussillon, France was overall too sweet but I won’t lie; I did scrape the ramekin. This was perhaps the one course I would have preferred to have had the tea option as the Dian Hong Gold buds, Black tea, China with a hint of citrus note appeared to go down really well for my two friends. We finished the evening with an array of Australiana themed petit fours. Whilst the waiter explained what they were, my wife had to explain the “cultural” significance of each item to our foreign guests as we appreciated it was not necessarily obvious. 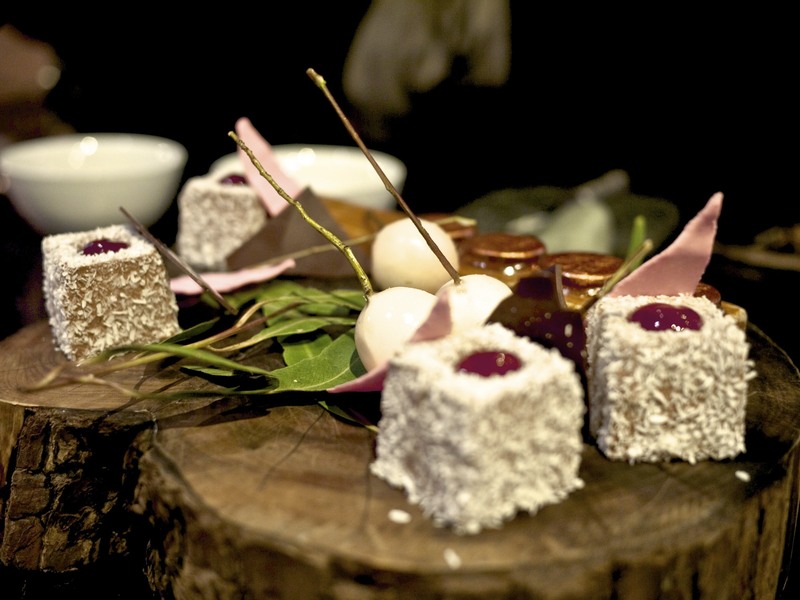 We were served: chocolate mousse lamingtons with raspberry coulis inside (a typical Australian cake), musk flavoured eucalptus leaves, gin jellied one penny coins (used to play two-up, a traditional Australian gambling game which is now illegal except on Anzac day) and eucalyptus flavoured sorbet balls. It was close to 2am when we finally got the bill. I appreciate that the same meal would have probably taken a couple of hours less had we been in a smaller group but we enjoyed every minute of the privacy in the majestic Dom Perignon room with our private view into the kitchens. We left with some goodie bags which contained some brioche bread, tea, honey and muesli. A lovely touch indeed but had the whole experience lived up to my expectation? I thought the food on the whole was great and the service stepped up a notch from our last visit as it was flawless throughout the evening. Nothing seemed too much of an effort for the exceptional front of house team and we were all impressed. There was of course the matter of the two disappointing meat courses, and I noticed across my two meals there that there was a tendancy to incorporate emulsions repeatedly which felt tiring after a while, both in terms of texture and flavour. Saying that, there were a couple of innovative dishes that were exceptional like the marron tail, onion soup and the strawberry & creams dish. I left the restaurant content that evening with the overall experience and my guests certainly thought it was the best meal they had in Australia. But compared to my experience at Attica a couple of weeks later (see review on this website), I felt the latter had made greater strides in evolving its dishes since my last visit. I know it’s like comparing apples and bananas. Regardless, to me these two restaurants are currently my favourite in Australia and by quite some distance. 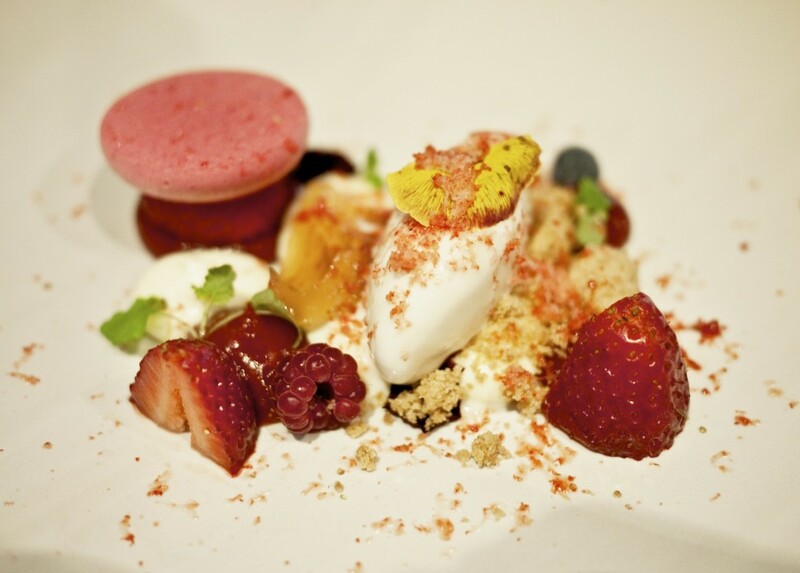 This entry was posted in Australia and tagged Australia, Melbourne, Shannon Bennett, Vue de Monde on June 24, 2013 by admin.